After two seasons spent fretting over "fit" and weighing concerns about chemistry, the Cleveland Cavaliers are rolling. They've swept into the Eastern Conference finals, making as-quick-as-possible work of the Detroit Pistons and Atlanta Hawks, and they're evidently feeling awfully good about the whole thing. They buried Atlanta beneath a record-setting barrage of long-range shots, making some wonder whether this version of the Cavs might pose a real threat to whichever behemoth emerges from the West. The play of Kevin Love has been an important part of this development. The power forward was a certified weapon against the Hawks, averaging 19 points, 13 rebounds and 2.5 assists per game in the sweep. He carried the Cleveland offense for stretches, scoring the first 13 points of the Cavs' Game 3 win and 15 points in the third quarter of Game 4 to help kickstart a second-half avalanche. "After the Brooklyn game he came to me and said I need to be more aggressive and demanding of the ball," Love said recently. "I think for a couple weeks there it was kind of me taking a back seat. I think March is a tough time. We were kind of waiting for the playoffs and there were what, 15-20 games left? Just being more aggressive and preparing myself for hopefully a long playoff run is what he was trying to do in telling me that." Lue reminded Love of his role alongside James and Irving. The coach emphasized Love's unique All-Star ability that earned him a max contract this past summer. 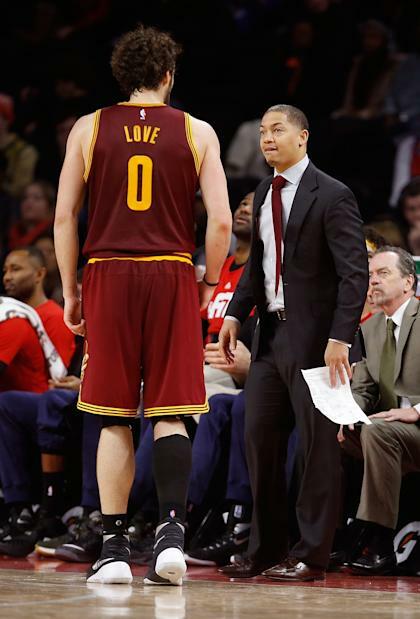 "You're a bad m-----f----- too," Lue told cleveland.com of his message to Love. "Play like it." "It just gave me a huge boost of confidence knowing that he knew what I was capable of and that they were going to — teammates — were going to find me and feed me for the last several games and heading into the playoffs," Love said. "So I think that helped not only me, but all of us as a team. So, I think it's kind of helping everybody out." It's certainly seemed to. Love took a much more central role in the Cavs' attack after that Brooklyn loss, averaging 18.9 points, 9.9 rebounds and 2.2 assists in 29.3 minutes per game over his final nine appearances on very strong 45.5/46.2/81.1 shooting splits. While his interior shot-making hasn't been quite up to snuff of late — on this score, he's got company on the Cavs, who made nearly as many 3s as 2s against Atlanta — Love has continued to make his presence felt, keeping his per-game scoring average consistent while pulling down nearly one-third of available defensive rebounds and drilling 44.4 percent of the 3s he's taking a whopping 7.9 times per game. How both team and player fare as the competition gets more challenging remains to be seen, but through two rounds, the Cavs have been dynamite with Love on the floor in just about any frontcourt configuration. The Love-Tristan Thompson frontcourt has outscored the opposition by 39 points in 197 minutes. The Love-Channing Frye duo torched Atlanta by 22 points in 29 minutes. And Love-at-center lineups are a +15 in 41 postseason minutes, according to NBAwowy.com. A great deal of that, of course, has to do with Love's company on the court. Of Love's 274 postseason minutes, 215 (78.5 percent) have come alongside James and Irving. You will be shocked to learn that Big Three units have been effective, outscoring Detroit and Atlanta by 13.5 points per 100 possessions. Love's clearly still a tertiary option in those groups; while Lue has called his number on the block or at the elbows at times, both James and Irving are thus far averaging more field-goal attempts and significantly more frontcourt touches per game than Love in the playoffs. And yet, Love's still getting nearly as many opportunities on a per-minute and per-possession basis this postseason as he did during his heyday back in Minnesota. It's not because the Cavs are pushing a pedal-to-the-metal pace that inflates stats. Cleveland ranks sixth among the 16 playoff teams in field-goal attempts per 36 minutes, and 14th in pace factor, averaging just 91.6 possessions per 48 minutes of floor time, a glacial tempo that would have ranked dead last in the league during the regular season by a mile. No, it's that the Cavs have been finding Love in the flow of their offense. Only Golden State Warriors sniper — and, until last night, primary offensive option — Klay Thompson is averaging more catch-and-shoot points per game than Love this postseason. Nearly half of Love's shots have come off a teammate's pass, and two-thirds have come without a dribble, according to NBA.com's SportVU tracking data. "At the end of the day, our shooting is coming from our ball movement," James said. "Myself and Kyrie are getting downhill, and we're attracting a second [defender], a third guy at times. Our shooters are locked in and ready. It's up to us to get the ball right there in the shooting pocket and they're good to go." "Kyrie and LeBron are so devastating and draw so much attention," Love said. "They do it in different ways, but in doing that Channing is going to be open, J.R. is going to be open, I'm going to be open. There's so many weapons we have on the perimeter." Including one who, quiet as it's kept, is only four years removed from a top-six finish in MVP voting and just two years separated from an All-NBA Second Team berth. No, Kevin Love isn't the primary reason the Cavs have been carving up defenses of late, but his ability to perform like an All-Star in a supplementary role has helped make Cleveland look more like a true contender than they have at any point this season. He might not be creating his opportunities, but spurred on by his coach's call, he's taking advantage of them, and showing everyone he's ... well, a long, colorful curse word.